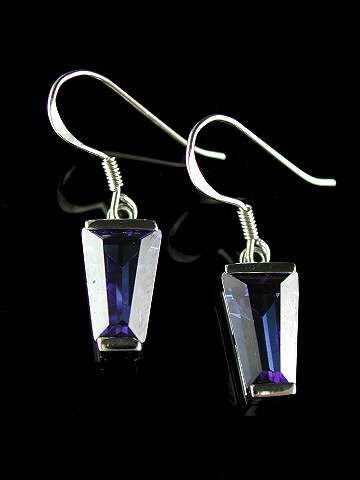 Exquisite, contemporary design, emerald-cut Siberian Tanzanite earrings, set in rhodium-plated 925 sterling silver. As every computer monitor colour & resolution is different, the best way to describe the colour of these beautiful earrings is pure violet. The colour is far, far better than we were able to capture in the photo and they sparkle with a vivid brilliance. We liked these earrings so much we bought three pairs! This is speciality quartz which is lab grown. Genuine Tanzanite crystals (which are becoming harder to source) are taken and grown in a lab to produce the the highest grade Tanzanite you can buy and they are completely flawless. In gemology terms, 'Siberian' means stones of the highest, flawless quality, hence the name. Metaphysically, Siberian Tanzanite carries the same qualities as regular Tanzanite. It also is said to be a powerful carrier of the Violet Flame. Archangel Zadkiel is Master of the 7th Ray - the Violet Flame. The keywords associated with this ray are Freedom, Mercy, Transmutation and Forgiveness - of the self and others. In the realms of the 7th Ray, alongside Archangel Zadkiel, we have the Ascended Master of the Violet Flame, St Germain. Just as sunlight passing through a prism splits into seven colours, so spiritual light manifests into seven rays. The energy of the 7th Ray bursts forth and burns like a violet flame, dissipating fear and darkness, inspiring the qualities of mercy, compassion, forgiveness, justice and freedom. It is said that the Violet Flame is the key to resolving and removing all karmic debt, not only for ourselves and others, but also for the planet.